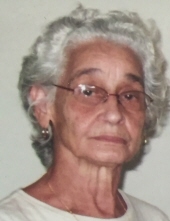 Carmen Lydia (Perez) Gonzalez, 91, passed away peacefully on Saturday, November 10, 2018 at Wadsworth Glen in Middletown surrounded by her loving family. She was the beloved wife of Alejandro Gonzalez for 68 years. Carmen was born in Toa Alto, Puerto Rico on February 6, 1927. One of seven children, she was a daughter of the late Andres and Rosa (Garcia) Perez. Along with her husband, Carmen is survived by her daughters Maritza Gonzalez Kobylack and Migdalia Gonzalez; three grandchildren: Leslie, Kimberly, and Kevin; and five great-grandchildren: Jose Manuel, Alejandro, Armando, Wesley, and Miacarmen. She also survived by extended family and friends. She was predeceased by her son-in-law John Anthony Kobylack Jr. (Tony). Relatives and friends may visit with her family on Wednesday, Nov. 14 from 5 to 7 p.m. at Beecher & Bennett-Flatow Funeral Home, 48 Cook Ave., Meriden. Funeral services will take place Thursday, Nov. 14 at 10 a.m. from the funeral home with a Mass of Christian Burial celebrated at 11 a.m. in St. Rose of Lima Church, 35 Center St., Meriden. To share a condolence with Carmen’s family, please visit www.beecherandbennett.com. To send flowers or a remembrance gift to the family of Carmen L. Gonzalez, please visit our Tribute Store. "Email Address" would like to share the life celebration of Carmen L. Gonzalez. Click on the "link" to go to share a favorite memory or leave a condolence message for the family.